Flight Control made it to the Android Market today. $4.99?????? What???????????????????? I'll be sticking with one of the substantially less expensive yet just as good clones already available like Air Control or Flight Director. Namco used to be my absolute favorite game company. Not any more with the ridiculously non-competitive pricing of their mobile games. After posting the game's Press Release earlier this week I took the time to download and try out Letter Rip! That's interesting in and of itself because I generally run from word games as I'm far more of a numbers person. Yes, I stink at Scrabble and Word Jumbles. It's not that I want to be poor when it comes to rearranging letters in words... it just comes naturally. Letter Rip! provides you with a grid of letter tiles much like in Scrabble. 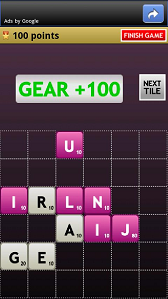 However, as you play new, new tiles randomly appears on the board and it's your job to drag them around to form words of three or more letters. Once you create a word you can then drag over it, clear those tiles off of the board, and score points based on the letters used. The game is that simple. My criticism of the game comes in two forms: minor and major. My minor criticism is that the game start really slow with one tile on the board. Why not three if it takes at least three letters to make a word? My own reason would be that perhaps it gives me time to think of words using that first and second letter. Ok, but then why does the game ramp up so dang fast. Don't get me wrong... I LIKE fast, but only when it's an option. The game needs difficulty levels and the option for slower ramp up speeds. Generally I can get about 4 or 5 words before the board fills with Ys and Zs. My major criticism is a big one. The game has a nasty, nasty crash bug that deperately needs to be fixed. I'll be playing and doing well and boom... back to the title screen. I'm not the only one either based on Market reviews. I don't know if the author can't reproduce the bug or what, but it's there and it's a major show stopper until it gets fixed. And I sympathize with being in that situation especially if the author can't reproduce the problem and doesn't have a giant budget to purchase all sorts of different Android devices for testing. I sincerely hope the crash bug can be fixed as this game is good enough to warrant attention. This is a nice, clever little cross between Scrabble and Tetris. And it's a free, ad supported game. I'm going to withhold a review score, though, until the game stops choking right as I'm about the beat my high score. With HandyGames' recent press release that I just posted, I figured I'd provide my take on the Xperia PLAY. I'm now at the point where I've had a cell phone for over a decade. My first phone was a Kyocera Palm based phone and the reason for getting it was so that I could be contacted 'on call'. Being a gamer I also liked the idea of being able to play where I wanted with a device that was already going to be coming along for the ride anyways. While my Palm phone had some decent games on it the experience was still worlds away from even that of a GameBoy. I then moved over to become a Windows CE adopter, but arcade games just weren't strong on mobile phones. The Nokia N-Gage was actually an interesting, but failed, attempt that I, fortunately, never purchased. Until recently it seemed that my perfect device just couldn't exist. And then the iPod Touch (and iPhone) changed that. Actually another device called the Pandora caught my attention before the iPhone and I preordered in late 2008. The claim was that they were going to be shipping at the end of 2008. Dream device my a@@. These people, and I almost want to use the word crooks, had a 'problem' with the bank and they wanted to blame EVERYTHING regarding the device's many delays on the bank. In the end I got a refund, but only after exchange rates changed so in effect I lost money because they were grossly optimistic about when they would deliver product. In fact even today they are only barely starting to ship the device with specs from the year 2009. Now, with more recent devices, I'd say the Pandora is dead before it leaves the gates with the exception of a handful of groupies they seem to have brainwashed over at their website. Hey, I'm all for the little guy, but only if the little guy can honestly deliver what they promise. One of the key features for the Pandora, though, was the control pad coupled with a keyboard. I'm a classic computer nut and I love the whole idea of emulating old video game consoles and computers so that I can play the games of my childhood. Yes, I'm very nostalgic. The Sony Xperia PLAY could actually be the first device to offer the kind of experience I'm looking for. It offers reasonably current hardware specs including a 1 GHz CPU and state of the art graphics along with quality gaming controls. On the down side I get nervous about further fragmentation of the Android Market. I know Sony claims to be planning on letting other phones get in on the whole Playstation Phone concept, but suppose it's really successful? Might Sony then tighten their grip on the platform? And I'm just not convinced that having a superset of games than only the elite Playstation Phone owners can access is the way to go and would much rather see more powerful, Android compatible hardware. In the meantime Apple is doing all they can to help Android steal their market. First, it was the lack of Flash on Apple devices. Now Apple wants to ensure they get their 30% cut on all magazines, newspapers, ...etc that one subscribes to electronically. A closed platform will not be the consumer's best friend when all is said and done. I've been wanting to upgrade phones (and jump ship from Verizon) for about a year now. The Epic 4G offered hope as I really want buttons for gaming (and a keyboard suffices), but poor support (i.e. no Froyo) has meant no sale to me. Now I may as well wait for something better and maybe the Xperia PLAY will be it. Giebelstadt/Germany, 15th February 2010 - Sony Ericsson's long-awaited gaming smartphone Xperia PLAY was showcased on Sunday at the Mobile World Congress in Barcelona. As an official Xperia PLAY launch partner, HandyGames™ are providing MWC visitors with a first look at three HandyGames™ titles for the Xperia PLAY at the Sony Ericsson exhibition booth. In addition to the award-winning casual brain training game infeCCt™, HandyGames™ will present Super Dynamite Fishing, an acclaimed HandyGames™ classic, enhanced and optimised for the device. The third game, the immensely popular blockbuster title Guns'n'Glory, combines traditional Tower Defence gameplay with new, innovative gameplay elements in a fresh Wild Western setting. All three titles have been specifically adapted to fully support all Xperia PLAY features and will be available for free download. "HandyGames™ is planning to release a strong portfolio of quality casual games for the Xperia PLAY in 2011. ", comments Markus Kassulke, CEO of HandyGames™. "Free mobile games are more popular than ever before and we will continue our successful strategy ‘Mission FREE‘ on the Sony Ericsson Xperia PLAY." Guns'n'Glory, infeCCt™ and Super Dynamite Fishing will be available for the Xperia PLAY immediately at launch, with more titles following in the coming months. Skiing games are a mixed bag for me. I love Alpine Racer on the iPhone and would like to see Namco release an Android version if it. The only skiing game I've tried on Android is Backcountry Ski and that was over a year ago... maybe it's improved, but it's still $5. Alpine Boarder caught me by surprise. It looked pretty good from the screen shots, albeit a little small, but as a free game I figured it warranted a try. To my surprise, I was quite pleased! The game was actually fun and made me want to play again. Alpine Boarder isn't actually a skiing game... it's a snowboarding game. And you control your snow boarder by tilting your phone back and forth. Initially I found myself twisting the phone, and while that works it can have the side effect of making it more difficult to see your phone's screen. Tilting works just fine, though. The game features several slopes presented as a campaign. In order to advance you have to earn a medal which means finishing in one of the top three spots to earn the gold, silver, or bronze. As you snow board down the hill you have to maneuver between various sets of flags, but outside of that it's up to you. Feel like heading on through the forest and trying to avoid the trees? Go for it! Naturally you'll pick up speed when headed straight down and you can slow down, or even stop, by steering left or right from that. 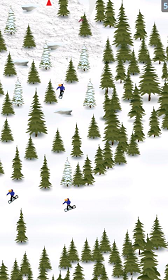 The game features five basic types of terrain: snow, rough snow (slows you down), ice (speeds you up), rocks (jumps) and trees (break your leg, they will). The graphics in Alpine Boarder are good, but they are also small. Fortunately the size doesn't detract from the game as, with the perspective the game uses, the small size lets you see further ahead so that you can make better control decisions sooner. The controls for the game as very responsive and that's probably what made this so much fun to play. When playing you can only miss two of the flags before having to quit the race in the shame, but the game is pretty liberal in giving you credit for sliding between flags. Alpine Boarder isn't without fault, though, and actually there's a bit of a list of issues. For a start, once I made it to level 2 I started getting warnings telling me I'm about to run out of memory and that the game might shut down without warning in the middle of a race. The game has never actually shut down and this error may be due to my seemingly ancient Motorola Droid phone and its lack of memory compared to newer devices. Next, when starting a race, there's no countdown... once the game loads it goes. It would be nice to have some indication that the race is about to begin as they do in real life (they do that for a reason!). Third, you can collide with other boarders and knock them down or be knocked down... who falls down, though, is anyone's guess. If I could better understand that perhaps I could use it to my advantage. Fourth, it appears that my competition doesn't have to ski through the flags in the same way that I am forced to. Am I right? Finally, the game is pretty hard, especially after level one, and the requirement of finishing with a gold, silver, or bronze in order to advance and see new levels seems steep. It would be nice to be able to skip ahead to another level at anytime, or, at the very least, after trying and placing in a prior race. Yes, that's a long list of issues, but don't let them scare you away from what is overall a nicely done game. If racing in the snow holds any appeal to you then you'll want to give Alpine Boarder a try. It's a nice casual game that can be played for a few minutes here and a few minutes there. It has a really good feel to it and earns 4/5 stars. Editor: Note that these are all from press releases and none of this information is intended as any sort of endorsement. In Poker Swap a 5 x 5 grid of cards is dealt. You can then swap any cards to create poker hands. Add bonuses and other surprises to the mix along with a classy interface and you've got Poker Swap. The game features four game modes (Quick Game, Zen Mode, 3-Round Game, and Survival) and OpenFeint support for leader boards / achievements. Two versions will be available upon release - a full, paid version and a free, ad supported version. From Yumy.Info comes SeeWords: a thinking word game where the action takes place in your head. It, too, is available in both a free and pro (paid) version. Scrabble meets Tetris meets Slide Puzzles! Players slide (Rip!) tiles around the board to form words. Once a valid word is created its tiles disappear. Random letter tiles continuously appear as you race to prevent the game board from filling up. Once the board fills up, the game play changes and you will need to clear the board of all the remaining tiles. You will have extra tiles to help you and can even buy letters with your points. Clear the board and you get an extra 1000 points. How fun is that? See how you stack up against the competition on the leader board courtesy of OpenFeint. Get Ripping! The game is, as the title suggests, about juggling. The full version has 25 playable levels and global highscores. You start out as a street juggler with three balls and at the end of the game you juggle at the Grand Stage with nine balls at the same time. The Lite version has global highscores and two of the 25 levels. 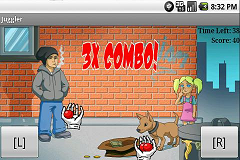 You can also do combos, which increases the amount of points you get. Highly popular old-school arcade racing game “Final Freeway” has been released for Android devices and is immediately available on the Android Market. “Final Freeway” brings the unique arcade driving mechanics and rendering style from the racing games of the late 80s, to mobile devices. Originally released in August 2010 for iOS, it quickly gathered positive reviews from specialized media and the public alike and was featured in the App Store markets worldwide to reach the #1 spot among the iPad racing games in most countries, including US, Japan and Italy. This game is now available for Android OS, where all the original contents from the latest iOS version are maintained and a new control scheme is added, along with full support for the complete gamut of Android devices’ display resolutions. “Final Freeway” places the player in a race across 8 different and unique stages, to be played in two courses or one stage at the time. The game is a fast paced arcade racer capable of very good frame rates on older devices, while also taking advantage of more recent Android systems to achieve the best possible playing experience. I'm not a big fan of racing games which may make me appreciate driving games that mix it up a bit that much more. I really enjoyed the Need for Speed series once they added the ability to be chased by or become the police. There's also a pretty cool arcade game, although I forget the name, where chasing down and apprehending the bad guy is the goal. 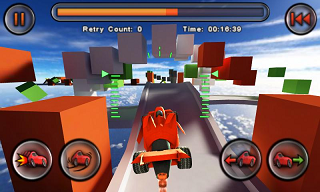 Jet Car Stunts takes driving games in another direction that is also quite entertaining. Jet Car Stunts is a very well put together game. It has an absolutely fantastic set of tutorials to get you going. I have to admit that when I first saw the screenshots of the game I thought the bottom right controls would be left and right. Nope, this game fully utilizes the tilting capabilities of an Android device and it feels great to play. The four buttons along the bottom are thrusters, brake, reverse, and accelerate and Jet Car Stunts is about more than driving around tracks doing wheelies. Instead your car is about one turbo thruster away from being able to fly. Sometimes you'll have to take a jump and engage the thruster to provide that extra oomph to make the jump, but other times you'll have to press the brake button which doubles as a flaps button when gliding through the air. With all of this control you'll be cruising through hoops and making hairpin turns like there's no tomorrow. And if there happens to be no tomorrow (i.e. you go over the edge) you're treated to a nice view of the cloud cover that you're about to descend through. The graphics in Jet Car Stunts remind me a bit of Virtua Racing on my old Sega Genesis w/ 32x add on. Very polygonal. The tracks match that graphical style. It's basic by today's standards, but I'd rather the game play smooth than wow me with infinitesimal detail for my car. Sounds match up well for thrusting and turning and I never had any problems with the controls. Tilt works great and can be adjusted in the options, although I never found that necessary, and the on screen buttons are well placed and big enough such that I never experienced any issues with unresponsiveness. Jet Car Stunts is among the most masterful games I've played on Android. Finding good games isn't too hard lately, but finding great ones is a challenge. Jet Car Stunts is GREAT! Plenty of tracks... online leader boards... 2 modes of play... all for $2.00. There is a demo version too, and I guess it's worth checking out just be sure the game will run well on your Android device. After you've verified that then buy it! This game earns a rare 5/5 stars. Agent is the only paid title I'm covering here so you'd expect it to be the best. It does have a free 'demo' version available as well. The author states that it's taken a year of work to make the game. Unfortunately, even with all of that work, at $3 it may be a little pricey for a simple shooter. I tried the demo and the title screen is less than visually pleasing. The game does, however, offer a campaign mode and multiplayer as it begs and pleads for you to give it a 5 star rating in the Android Market. I guess it doesn't hurt to ask? Once you make it into the actual game and through all the very primitively designed info screens the game is very nicely done. The targets move smoothly into place and have visual timers above them so you know exactly where you stand. Tap to shoot and you can feel that the game feels right on target. 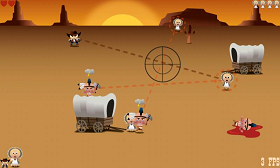 As the game advances more targets appear at the same time and then they start to shoot back and soon it's time to buy the full version with 38 more levels. As you progress you also earn money to buy 'in game' merchandise which is a nice, little touch. Multiplayer mode isn't really what I expected. In multiplayer there's a split screen with one player taking the top and the other taking the bottom while you compete at the same time. I was thinking network or hot seat play, but this is actually kind of cool. But a phone's screen is just too small to make this work really well with the scaled down graphics... multiplayer mode really cries out for a tablet. Eagle Nest is a free, ad supported game so you'll see ads during loading screens, but not during actual game play. The game doesn't offer much in the way of variety, but it does have a few differences from Agent including a pretty title screen. First, during play you'll be given a "goalscore" that you're trying to beat in order to advance and let me tell you that advancement is not easy. Second, it's the only game that doesn't offer a weapon with infinite ammo. You're equipped with a six shooter and have to tap the bottom of the screen periodically (or when you hear 'click' instead of 'bang') to reload. The game is accompanied by some nice music and while the animations aren't quite as smooth as in Agent it still looks pretty good. Lets Fire is odd for an interesting reason which I'll get to later. It's a freebie that has ads on its menu screen and features four modes of play: Normal, 1 Minute, Hunter, and Bubble modes. In Normal mode it's just a plain target shoot. The instructions say shoot and level up, but I never had any luck with that. 1 Minute mode is just as it says... hit as many targets as you can in a minute. Hunter mode has you having to shoot only targets of a given color. 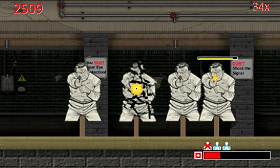 And Bubble mode has you shooting targets before they leave the play area. The game has a techno soundtrack playing throughout and offers no options... just the four modes of play. The graphics are ok with standard bulls eye targets occasionally being dragged by balloons or something else. Shooting is on a delay, but that's pretty clearly intentional... just tap to shoot and wait for a fraction of a second before hearing the sound of your shot ring through the air. Double, triple, ...etc tap and that subsequent shot fires immediately after your prior shot telling me that the game isn't suffering from a slow down issue with the firing delay. Now I said this was odd for an interesting reason and you'll note that I have no link, screen shots, or QR code for this game. That's because after downloading it I can no longer find it. The game contains no credits. The name of the game is apparently different depending on who you talk to... my icon's title says "Lets Fire", but once loaded the game says "Hit It" with bullets for the letter 'I'. In a nutshell, even if I loved this game I can't find it in the market as my searches for both of those titles didn't produce the correct game. Edit: Thanks to mrben for providing the new and correct name of this game: Finger Shooting. Photos and QR code added. Wild West Sheriff is a bit different in that it's not strictly a tap to shoot style game. Instead, you are defending a small group of settlers from invading cowboys and Indians. I'm assuming that you are the "Wild West Sheriff". You tilt your Android device to move a gun sight and then you tap to fire. Invaders often give a sign of when and where they're going to strike so you can prioritize your killing and the game treats you to a nice pool of blood left in your enemy's footsteps once they are properly dealt with. Once again not much in the way of options and once again the game is ad supported. However, the game does allow you to complete for spots on the Internet leader board via Scoreloop. I have to say that Lets Fire is the weakest of these games and that's saying something. It's not that it is a bad game, but just that it's been outclassed by the others in terms of graphics and theme. Just shooting a plain-jane floating target isn't going to be enough for a cream of the crop type game. Next, Agent, while probably being the best of the group, loses out because of the cost. It's quality isn't so superior that it's the go to game of the group. Yes, if you're so enthralled with this style of game you'll probably want to eventually get it and if it was a buck I'd probably give it the win, but not at $3 when other quality free games exist. The difference between Eagle Nest and Wild West Sheriff, however, is going to come down to preference. 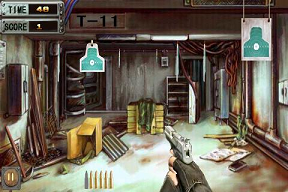 Do you want to touch to fire or do you like the idea of tilting your Android to move a gun sight? Fortunately you can have both for free and that's a good thing and a bad thing. Hopefully we, as Android owners, aren't getting so many ad driven freebies that it drives the larger commercial ventures away. I guess that remains to be seen. In the meantime, fire away. All four of these games are fun to play... if you can find them in the Market (I'm looking at you 'Lets Fire'). Kongregate isn't really a game... it's a shell for Flash games. With the massive increase in popularity of mobile gaming we've seen a lot of ports of mobile games to both the iPhone and Android platforms. One of the many reasons to be an Android owner, however, is the recent support of Flash on the device which allows one to view Flash on web sites and suddenly be able to play the countless Flash games that already exist without a 'porting process' having to occur. The problem with this is that different devices are, well... different. Your home PC probably has a mouse and your mobile device probably has a touch screen. This creates differences in using these Flash games and provides one of many awesome excuses for Steve Jobs to exclude Flash support on the iPhone. Kongregate is a web site full of Flash games. FREE Flash games. Once again advertising is the key their financial success. Kongregate encourages developers to create new games with both weekly and monthly prizes. Their catalog boasts of almost 40,000 games, but with Kongregate for Android it's closer to 400 in exchange for having this games tested as mobile games that don't rely on the traditional keyboard/mouse combination. Kongregate wouldn't be any good if all of the games are lousy and they certainly aren't all winners, but there's enough here to make for a worthwhile addition to your Android gaming experience. Among the games I tried were 'Hexlom Mobile' which is a puzzle game in which there's a hex grid and some of the hexes contain numbered pieces. The number indicates how many other pieces a piece needs to be adjacent to in order to solve the puzzle. There's also 'filler Mobile' which reminds me a bit of the arcade classic Qix in which you touch the screen to blow 'bubbles' which little particles float around the playfield. If a particle touches a bubble while it's being created then it's destroyed. If you release then the bubble falls to the bottom and takes up space and that's the over goal... to fill up 2/3rds of the play area. I also tried 'Vector Conflict Mobile' which is a fast paced arcade game using vector style graphics. Touch the screen to fire at the oncoming forces. The game played much too sluggish on my Droid to be worth of any serious time. Finally, I played 'Pinch Hitter! Mobile' which is a sandlot Home Run derby baseball game. It doesn't have any instructions which made it hard to play, but eventually I figured out that I had to drag to move my player inside/outside as well as to adjust his swing up/down. Not bad, but I do think Flash mobile makes for far better casual and puzzle games than fast paced arcade games and based on the number of games in each category I am not alone. If you're looking for some good, quick, simple fun then Kongregate may provide you with your answer. The interface for finding games is pretty good with basic search facilities as well as options such as viewing Staff Favorites. Each game is rated by the community and I'm sure more games are coming soon. I'm not going to give this a star rating because it's just another interface for accessing games, but I will say that it's certainly worth trying. I'm glad I did.